Already Daniel Craig enjoyed the service and the comfort of this suite and of Hotel Bergland during the filming of the James Bond movie “Spectre” in Sölden. A common living area with an exceptionally spacious balcony facing south, with a view of the Ötztal Mountains. 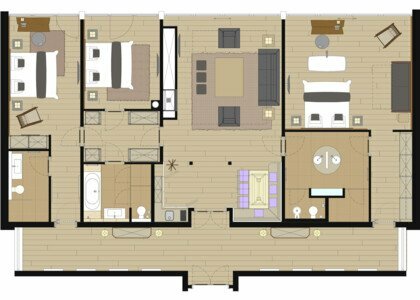 The suite further has 3 separate bedrooms with en suite bathrooms. 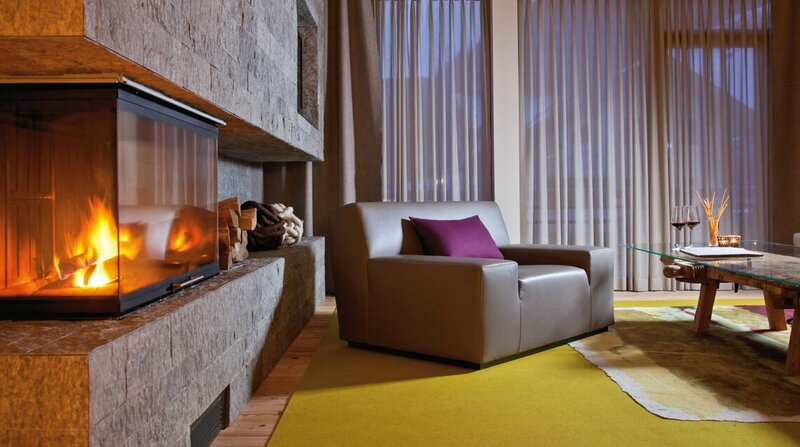 The heart of the Summit Suite is the 60 m2 fireplace room. With a large sofa lounge and an open fireplace, it is perfect for beautiful hours together. 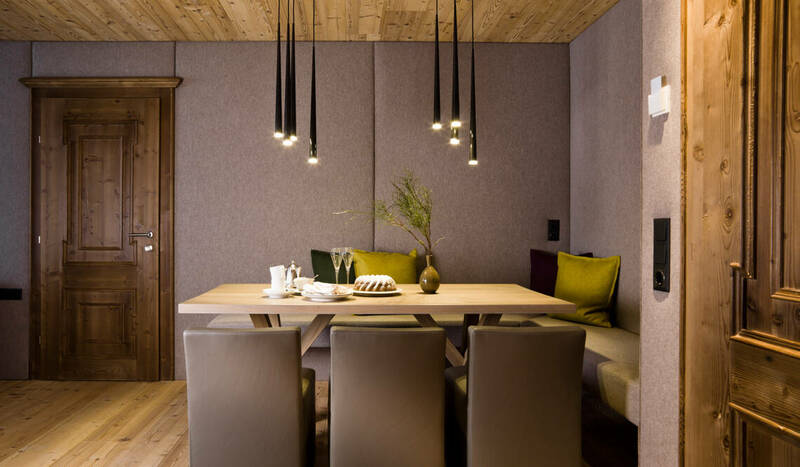 The living room of the luxury suite also has a large dining area for private dinners. In addition, the luxurious living area is furnished with a kitchenette with refrigerator, a NEPRESSO coffee maker, a tea maker, and an elegant mature timber flooring as well as a flat-screen TV and DVD player. The walls of the fireplace room are completely lined with loden and thus guarantee complete silence and peace. The unique Summit Suite has 3 separate bedrooms with en suite bathrooms. From each room, the common fireplace room can directly be accessed via the hallway, which is also part of the suite. 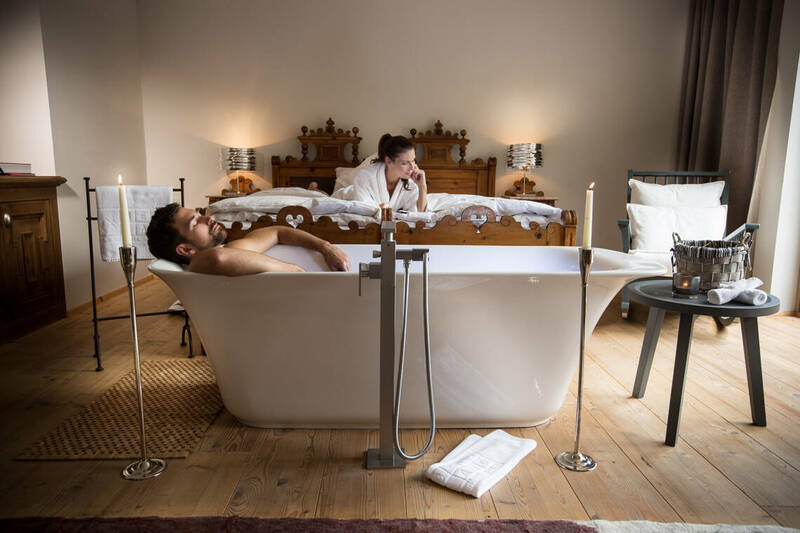 The bed- and bathrooms are designed in different ways. One bedroom has a detached double bathtub with a marvelous view of the Ötztal Alps. The en suite bathroom is furnished with double sinks and a steam shower. The other two areas of the Summit Suite are a little smaller, but impressive due to the luxurious as well as functional facilities. In addition, each room has its own flat-screen TV. Basic bathroom facilities: Hair dryer, make-up mirror, exclusive La Ric care products. The bathrooms of the various bedrooms are furnished differently. The facilities of each bathroom are outlined in the floor plans of the rooms. 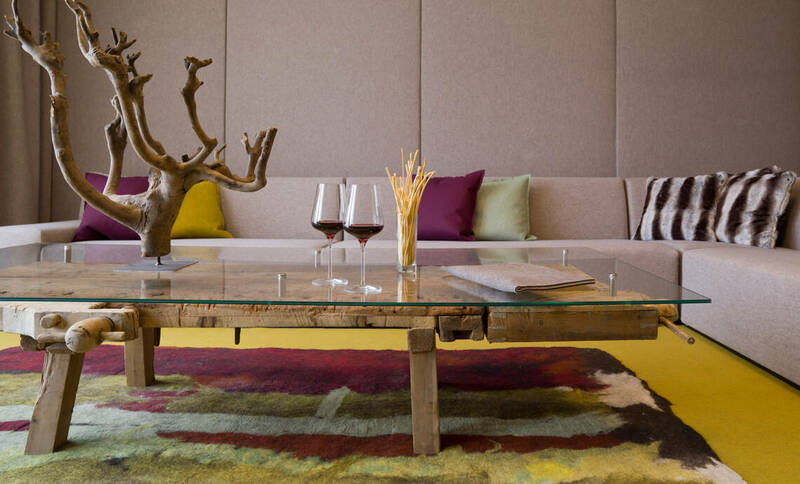 Family luxury – for our guests who wish to spend an unforgettable vacation with their loved ones & friends and especially enjoy the unique amenities of Hotel Bergland and be among themselves from time to time.